Central Mortgage & Housing Corp. Air Force Construction Report dated 15 November 1952. Royal Canadian Air Force Construction Report dated 30 November 1952. Weekly reports on USAF ADC sites by US engineer officer in those sites. Northeast Air Command (USAF) site reports are based on Corps of Engineers (U.S. Army) Atlantic District Report of Progress as of 30 Nov 52. USAF advance detachments are now at Ramore, Beausejour, Sioux Lookout, Armstrong, Pagwa and Puntzi Mountain. RCAF units or detachments are at Mont Apica, Lac St. Denis, Foymount, Edgar and Falconbridge. (i) - Tie Lines: A report received from the Bell Telephone Co. of Canada dated 15 Nov 1952, noted a number of circuits made available during the past two months. These changes, which include lines having an "in service" forecast of 15 Dec 52, have been added to the Primary Communications diagram which is included as page 11 of this month’s report. Other changes made on the chart are as follows: Saglek Air Base (formerly Hebron) is now shown as an airstrip. The air strip formerly known as l’Annonciation is now shown as La Macaza. Some changes in the designations of ADCOM links and phases have been made. The links and phase numbers as noted below will be adhered to until further notice. Phase 1 - St. Hubert – Lac St. Denis - Tests on this portion have been completed. Twelve voice circuits are ready for operation. No teletype circuits are available due to lack of filters and test specifications from manufacturer. Phase 2 - Foymount - St. Hubert - Buildings on relay sites are completed and deliveries of equipment and installations work will begin approximately 15 December 1952. Phase 3 - Mont Apica - St. Hubert - As above for phase 2. Phase 4 - Edgar - St. Hubert - As above for phase 2. Phase 5 - Falconbridge - St. Hubert - Construction of relay sites now underway. Phase 6 - Senneterre - St. Hubert via Falconbridge - As above for phase 5. Phase 7 - Parent - St. Hubert via Falconbridge - Legal surveys under way to permit acquisition of land. Construction awaiting AFHQ authority given to proceed with micro-wave installation. Phase 8 - St. Hubert via Mont Apica - Legal survey data presently in preparation to obtain access permission from Quebec Government. Construction may proceed as soon as access permission granted. b - VHF air-ground-air communication is in and functioning operationally as Sites 1 (Mont Apica) and 2 (Lac St. Denis). VHF system installation work has started at Sites 3 (Foymount) and 9 (Falconbridge) . Plans for VHF system at Site 4 (Edgar) are completed. c - HF Back-up communication equipment is being installed at Site 1 (Mont Apica) and installation work is underway at Site 2 (Lac St. Denis). Falconbridge - Main radar electronic tests completed and test flights began. Electronic tests on ISG 98 sets are in progress with test flight beginning first week of Jan 53. Foymount and Falconbridge - Main radar installation well advanced. Radomes have been erected. Parent and Senneterre - Work progressing on main radar. Radomes erected at Parent..
(i) - Radio - Installation planning for HF point-to-point and UHF-VHF air-ground facilities is approximately 85% completed. However, informal information indicates AN-URA8 radio teletype terminal equipment is to be substituted for TMC DDR2 radio teletype terminal equipment previously specified. This substitution, if effected, will cause approximately six (6) weeks delay in completion of HF point-to-point installation engineering plans. Action on LF antenna systems for NEAC is being held in abeyance pending receipt of information from USAF HQ as to source of installation and engineering funds. 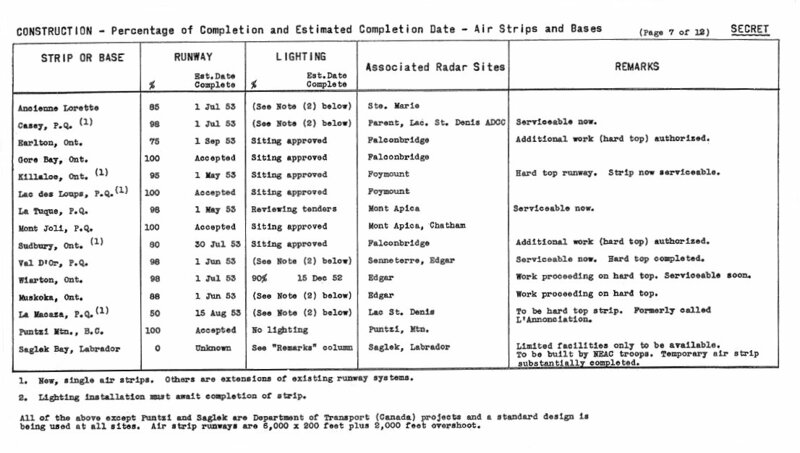 (ii) - Radar - Installation engineering plans for primary radar facilities are approximately 80% completed but the substitution of RCAF-designed pressurizing equipment to replace that designed by Bendix for FPS/3 radars will delay the finalization of these plans until approximately 1 Mar 53. Sufficient advance engineering information can be made available to installation contractors to permit them to begin installation with exception of the pressurizing equipment. Installation engineering plans for AN/TPS-10D facilities are approximately 75% complete and finalization is estimated by 1 Feb 53.
a - Outside Plant: - Engineering for ADC sites is approximately 85% complete and will be completed by 1 Jan 53. Engineering for NEAC is approximately 50% completed but had been delayed approximately 30 days. Estimated completion date is 1 Feb 53.
b - Inside Plant: - It is the intent of PPO to have all necessary inside plant telephone engineering accomplished by Northern Electric Co. concurrent with design of N.E 611 and 612 telephone systems. However, configuration of these systems is being closely monitored to ensure any necessary installation data will not be overlooked. The services of a telephone equipment engineer have been obtained from Bell Telephone Co. of Canada and action has been started on the design of an ADCC facility utilizing standard commercial telephone equipments and conference systems. It appears that this design is entirely feasible and that ADCC requirements can be essentially fulfilled. (iv) - Installation: - Preliminary consultations have been held with primary electronic installation contractors and sufficient advance engineering information has been placed in their hands to allow planning and procurement of contractor-furnished materials. Further direct action by the contractor cannot be taken until a letter of intent or a contract is negotiated by DDP. Beneficial Occupation Date (B.O. Date) - is the date on which an electronics installation crew can be accommodated on the site and begin installation of telecommunications equipment. Limited Operation (L.O.) - The site is capable of initial operation and is considered technically complete when site construction is basically complete, basic major radar equipment is in place, minimum communications network is available and calibration can begin. Survey: - Photographic Survey Corp. have completed delivery on the major portion of their contract and a detailed examination of the information, covering the radio profile paths between repeater stations, has been carried out. This project is presently under review by Continental Air Defence System (CADS) Group of the Bell Telephone Laboratory. Equipment: - Proposals have been submitted by several equipment manufacturers to the Canadian Department of Defence Production. Pinetree Micro-wave Group have examined these reports and is prepared to make its recommendations when a covering contract is received from USAF.